Pet insurance helps pay unexpected veterinary bills when injuries and illnesses occur, helping your pet receive the best treatment regardless of cost. Petplan, a corporate supporter of CPL, provides comprehensive coverage and flexible plans to fit any budget. With each Petplan insurance policy purchased through this website, Petplan will provide a referral donation to CPL. 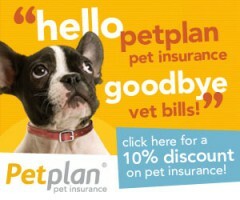 To purchase Petplan insurance click here. We encourage you to do research before purchasing insurance to find the company and policy that best meets your needs.